Rocklahoma is set to take place on May 24th,, 25th and 26th at Catch The Fever Festival Grounds in Pryor, Oklahoma, just outside Tulsa. Now in its 13th year, America’s Biggest Memorial Day Weekend Party will feature performances from some of today’s top rock artists, including: Ozzy Osbourne, Disturbed, Shinedown, Bush, Seether, In This Moment, Steel Panther, Jackyl, Asking Alexandria, and many more. The event will also be hosted by Radio/TV personality, Eddie Trunk. “Believe it or not, I’ve been doing shows in Oklahoma since 1971, so I know that they have some of the best audiences in the world there, says Ozzy Osbourne. Early bird weekend Festival Passes, as well as weekend VIP Packages, will be available for purchase starting on January 17th at 10:00 AM CT at www.Rocklahoma.com. Early bird pricing will last through January 24th at 12:00 PM CT, when prices will increase. A Payment Plan option will be available which allows purchasers to split the cost into four monthly payments. Fans are encouraged to buy early and save. The campgrounds are a unique part of the Rocklahoma experience, with an endless party running around the clock. The Rocklahoma campgrounds will be open from Sunday, May 19 at Noon CT through May 28th at Noon CT. Festival doors open at 2:00 PM daily on May 24th, 25th and 26th. Note: Camping is only available with weekend ticket purchases. The party starts early with this brand-new Rocklahoma experience opening every day at 11:00 AM. The Roadhouse will feature the D&B Processing Stage where fans can rock out with local Oklahoma favorites, top tribute acts, and will be headlined each day with national legends like Lita Ford and Ace Frehley. The Roadhouse will also feature food trucks, a full-service bar, and a great place to hang with your friends throughout Rocklahoma. A new destination at Rocklahoma, Burgers, Brews & Barbecue will be a place to sit down, relax, and enjoy some great local food from the best burger and barbecue joints from around the Southwest. And what better way to wash down that great food than with a cold craft beer? The ROCK 66 Market will be a new destination for fans to connect with friends, shop for unique one-of-a-kind items, charge your phone, or grab a cold beverage. The ROCK 66 Market will feature quirky items, artists, jewelry makers, and other unique vendors from the local are and from around the country. 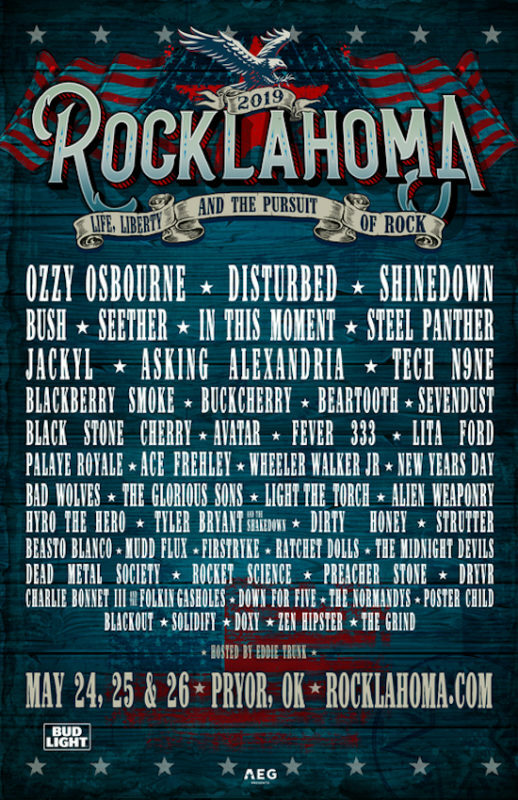 Rocklahoma is located just 45 minutes northeast of Tulsa, in Pryor, OK. The Catch the Fever Festival Grounds is a premier destination for a multi-day festival and includes onsite camping with access to restrooms and shower house, a general store for campers, VIP reserved seating, hospitality areas and much more. Actually, there is show hosted by Chef Michael Symon called Burgers Brew And Que, hmmm? I know, I can’t watch them either, but everyone around me, loves to watch those type of shows. Seriously. do not know how those food commentators do not get seriously overweight with all the food they eat – they must work out a ton. There used to be this show, I don’t remember what it was called, but the hostess went to all the best hotels/spas around the world, mostly owned by Relais & Châteaux and Leading Hotels of the World. I was so ENVIOUS of her, the hotels were all gorgeous, and she stayed in the best suites in some the most exquisite places. I remember one episode, she was on the Amalfi Coast of Italy, Wow…. Thank you, Gene & Paul! Hell of a line-up. I’m not sure I’d want to see Ozzy at this point in his career. While I love him and have seen him a few times, last time I saw him with Sabbath he was in pretty great form for his tender age. Yet, not sure i should see this tour or not. All hail the great Ozz!